Gov. John Hickenlooper today recognized the continued flood recovery and progress to rebuild from the September floods. 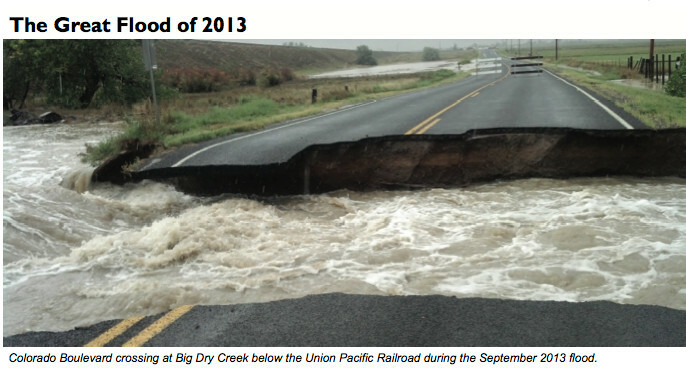 The flooding started on Sept. 11, 2013, and impacted more than 24 counties and more than 2,000 square miles in Colorado. This Tuesday, March 11, marks six months since the flooding started. Since the flooding, the Governor has visited all 24 impacted counties. The Governor, his staff and Chief Recovery Officer Molly Urbina have worked with impacted communities to assess their greatest needs and have joined with the Congressional delegation to secure funding to help rebuild. The Colorado Department of Transportation (CDOT) opened all 27 flood-impacted state roadways before the Dec. 1 deadline. All highways are in temporary condition and require permanent repairs. CDOT has begun the first long-term repairs on the US 36 emergency reconstruction project between Estes Park and Lyons, and also continues stabilization efforts on US 34 and SH 7. The stabilization efforts have resulted in some closures on the highways this Spring, but will help in an overall effort to maintain the temporary repairs through the Spring thaw until permanent repairs can be made. CDOT also made flood debris removal pick up available on the flooded state highways from November through March 7, which has resulted in the removal of over 115,000 pounds of flood debris. CDOT has $450 million allocated toward flood recovery funding with $55 million used to date. The Federal government continues to be a critical partner in on-going flood-recovery efforts. In preparation for Spring runoff, The Federal Emergency Management Agency (FEMA) announced they will reimburse the state and local governments for eligible costs to reduce hazards in streams caused by the September floods that pose an immediate threat to lives and property. For impacted mountain communities, FEMA determined last week that some publicly owned roads that are not routinely maintained by the county are eligible for reimbursement. Working with the State, FEMA announced on Monday that Colorado will receive a Disaster Case Management Program (DCMP) in the amount of $2,667,963. DCMP is a time-limited process that involves a partnership between a disaster case manager and a survivor to develop and carry out a personal Disaster Recovery Plan. The Federal Emergency Management Agency (FEMA) has obligated $62 million in Public Assistance funding to 538 projects in from 18 flood impacted counties. The agency funds 75 percent of eligible state and local projects for emergency measures, debris cleanup and repair of roads, bridges and other infrastructure. FEMA has approved $60.4 million in funding for Individual Assistance for rental assistance, basic home repairs and other critical needs of emergency assistance and has approved 16,542 individuals and families in 11 flood impacted counties, 28,368 have applied for Individual Assistance. The US Small Business Administration has loaned $98.8 million to date to 2,089 homeowners and 357 businesses. National Flood Insurance has made payments of $ $63.6M to more than 2,000 claims. The US Department of Labor awarded the State a National Emergency Grant (NEG) that provides $5.7 million to perform debris removal and clean up. The funds may also be used to provide humanitarian assistance for flood victims and subsidized jobs aimed at supporting the restoration of public infrastructure in FEMA-designated areas. The US Department of Agriculture’s, Farm Service Agency (FSA) provided $2.3 million through the Emergency Conservation Program (ECP) to cover rehabilitation to farm and ranch land, debris removal, and restoring permanent fencing and water-related structures to Colorado farms and ranches. The Town of Jamestown opened their Post Office in February and Drake will re-open their Post Office on Monday, March 10th. The U.S. Housing and Urban Development (HUD) Secretary Shaun Donovan announced $62.8 million in Community Development Block Grant Disaster Recovery (CDBG-DR) funds to assist in long-term recovery efforts. In December 2013, a statewide damage assessment was completed to determine those in most need specifically in housing, infrastructure and economic development. HUD requires that 50% of the eligible applicants for these funds be low to moderate income Coloradans and 80% of the funds must go to the three most impacted counties, Boulder, Larimer, and Weld Counties. In January a CDBG-DR Draft Action Plan was written based on the damage assessment and public input. The Draft Action Plan was made available at the end of January and early February for public comment and the public comment was incorporated into the final CDBG-DR Action Plan. Public comment was gathered through stakeholder meetings, public meetings and a public comment period on the website. The CDBG-DR Action Plan was submitted on February 21, 2014 to HUD which has 45 days to review and approve the Action Plan. Once approved the application process for the funds can begin. David Bowman, CDBG-DR Project Manager, will officially take on the role of CDBG-DR Project Manager on March 31st and manage the application and distribution process. An overview of proposed process to distribute the funds is available on the CDBG-DR Department of Local Affairs website: http://dola.colorado.gov/cdbg-dr.
Molly Urbina became Chief Recovery Office in February 2014, she leads the Recovery Office in collaboration and comprehensive long-term planning with Federal, State and local partners to build back a more resilient Colorado after the floods. Since the legislative session has started the Recovery office has worked with the bi-partisan Legislative Flood Committee to introduce bills that focus on Cost Share Allocation, Disaster Assistance, Tax Credits for property destroyed in natural disasters, and streamlining emergency response in future disasters. There are 621 employees from CDOT, OEM and FEMA currently working closely to address the ongoing needs of all Coloradans impacted by the disaster. A total of $1.42 billion has been allocated to date and $822 million is currently being used today to recover from our September flood. The Recovery Office is coordinating a long-term stream recovery group to focus on stream recovery, resilency planning and implementation strategies across State and Federal experts for Colorado Streams impacted by the flooding. 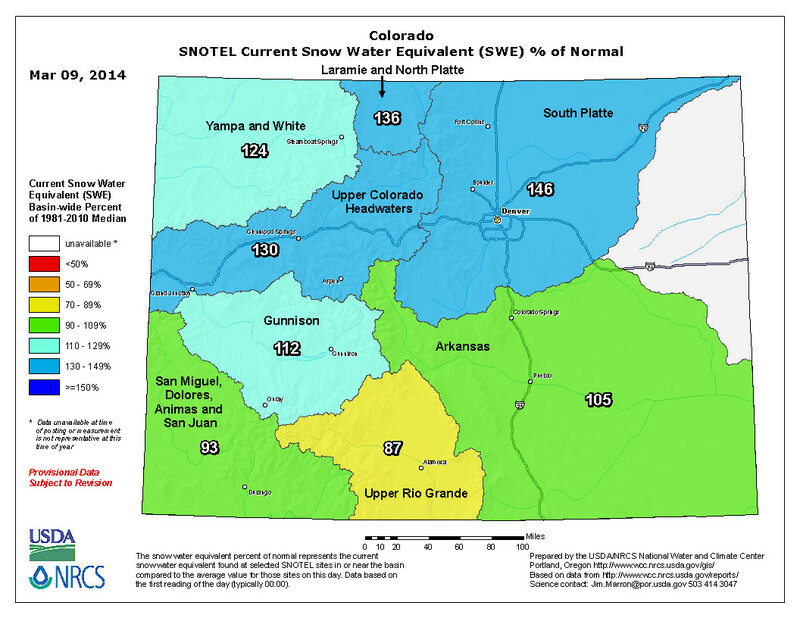 Colorado’s snowpack has tracked above the long-term normal for three consecutive months, said Phyllis Ann Phillips, Colorado state conservationist with the Natural Resources Conservation Service. It helped that the “Storm of the Century” blew through in early February, even though the century is still pretty young. That storm increased snowpack totals from 95 percent to 109 percent of the median in just four days, the NRCS said. Once again this year’s “No Nino” weather patterns favored the northern and central mountain ranges in Colorado, places like Vail, Beaver Creek and Steamboat Springs, Phillips said. The southwest part of the state, the Upper Rio Grande and the combined San Miguel, Dolores, Animas and San Juan basins, are suffering through another below normal snow year. While the combined San Juan basins did see a 3 percentage point increase from this past month, that put them at 85 percent of median, the Upper Rio Grande basin lost five percentage points, dropping to just 79 percent of median. Streamflow forecasts for the Colorado River Basin point toward above to well-above normal volumes for this spring and summer, Phillips said. She said the snowpack should improve reservoir storage.